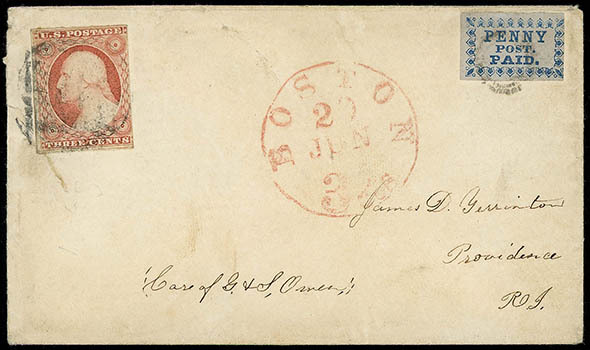 Boston, Mass., 1849-50, 1¢ blue on slate, tied by circular handstamp on cover with 3¢ dull red (11A), tied by large Boston "Paid" grid, red "Boston '3cts' 29 Jun" cds to Providence R.I.; tear at left, F.-V.F., ex-Ackerman. Scott No. 3LB2 Estimate $150 - 200. New York, N.Y., U.S. City Despatch Post, 1842-45, 3¢ black on light blue, huge margins showing complete dividing line on all sides, tied by red "U.S." in octagon handstamps on 1842 printed notice to merchant Moses Taylor, bold matching "U.S. City Despatch Post, Dec. 31, 4 O'Clock" cds, Extremely Fine, ex-White, Knapp; with 1996 P.F. certificate. ONE OF THE FINEST EXAMPLES OF THE U.S. CITY DESPATCH POST 3¢ ON LIGHT BLUE ISSUE ON COVER. 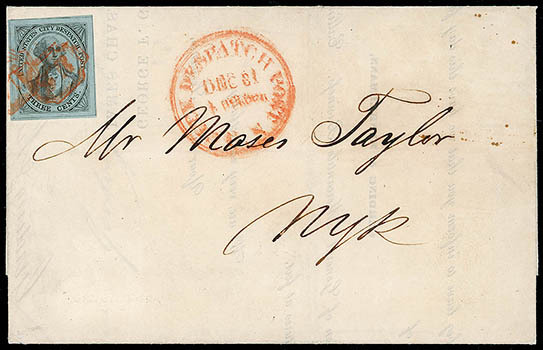 New York, N.Y., U.S. City Despatch Post, 1842-45, 3¢ black on light blue, large wide margins, cancelled by "US" framed handstamp "tied" by impression on inside of 1844 folded letter, matching red "U.S. Despatch, Apr 26" cds; couple filing holds, F.-V.F., ex-Robson Lowe. Scott No. 6LB3 $2,500 as tied. 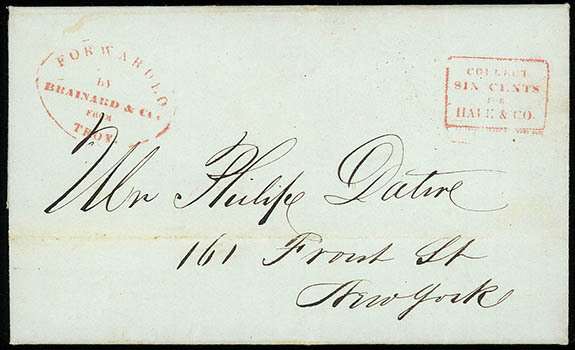 New York, N.Y., U.S. City Despatch Post, 1849, 1¢ Issues, each in combination with 1847, 5¢ red brown (1) on folded letters from New York to Albany, N.Y. from the Dexter correspondence; all but one 5¢ affected by file fold, Fine appearance; each with 2010 P.F. certificate. 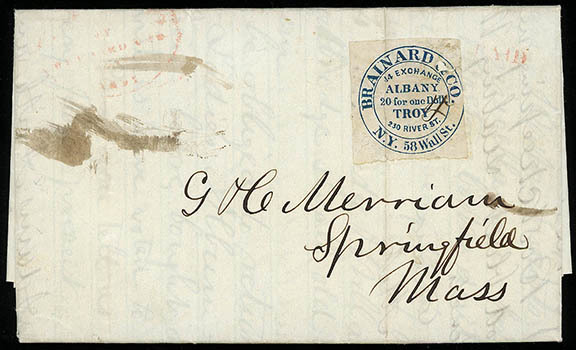 A REMARKABLE COMPLETE SET OF THE NEW YORK "U.S. MAIL" CARRIER ISSUES IN COMBINATION WITH THE 1847 5¢ ISSUE FROM A SINGLE CORRESPONDENCE, THE 6LB11 COVER BEING THE EARLIEST RECORDED USAGE. 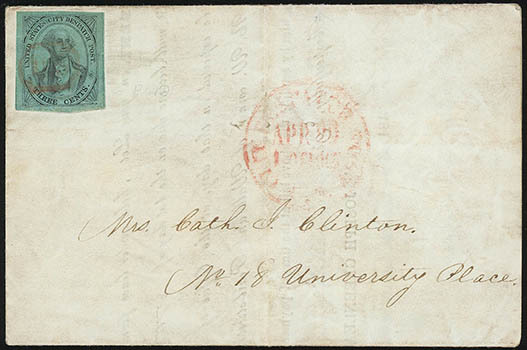 The black on buff issue (6LB11) cover is dated Nov. 12, 1849. This unique group of three folded covers with 6LB9, 6LB10 and 6LB11 are from a new find. 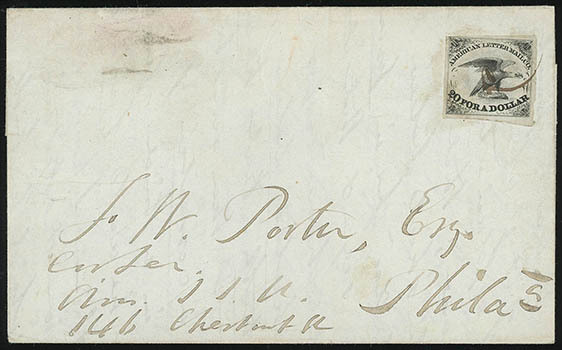 The exciting find of these three cover was documented in Alex Haimann's article "Recent Find of 5¢ 1847 Covers Includes Earliest Reported Use of "U.S. Mail" Carrier Stamp" (Chronicle #232, Nov. 2011 pp. 323-326). 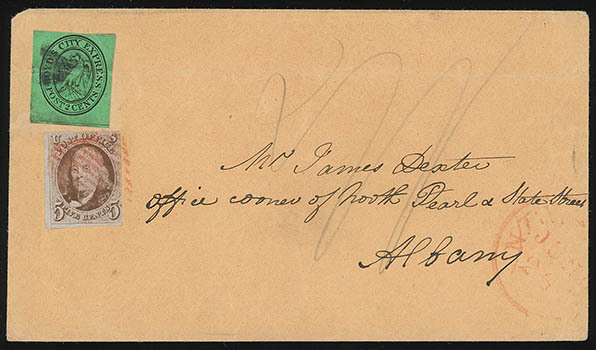 American Letter Mail Co., 1844, 5¢ black, thin paper (2nd printing), margins large to just touching frameline, tied by manuscript cancel on folded letter sheet to Philadelphia, Very Fine; with 2014 A.P.S. certificate. 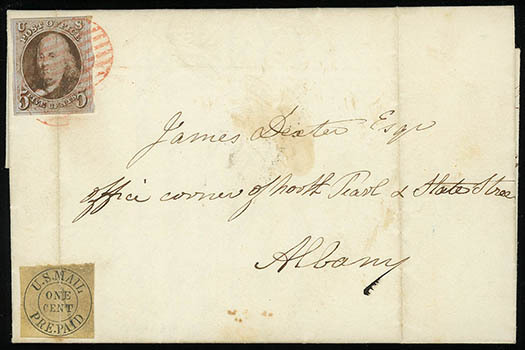 Blood & Co., 1843 (3¢) black on grayish, manuscript canceled on locally addressed cover; stamp and cover flaws, Fine appearance, still a rare on cover usage. Blood & Co., 1848-60 (1¢) entires, complete set of four used colored embossed entires, each canceled by grid handstamp, 15LU4 with file fold through indicia, otherwise Very Fine. 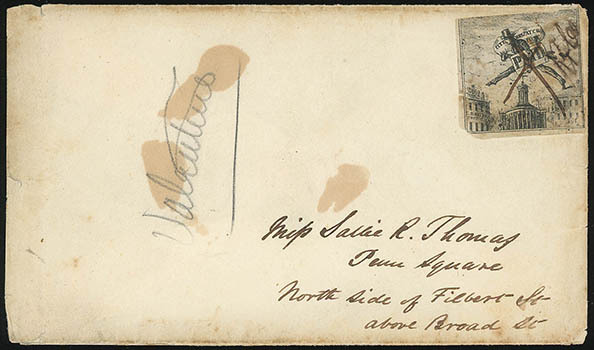 Boyd's City Express, 1848, 2¢ black on green, cork canceled on cover to Albany, N.Y., in combination with 1847, 5¢ red brown tied by red square grid handstamp, matching "New York, Jun 24" cds; light file fold affecting local and small cover scuff, F.-V.F. 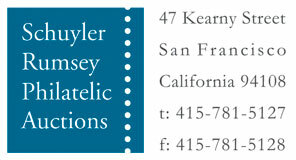 appearance, illustrated in The Chronicle (232) in an article on the Dexter find (page 326); with 2010 P.F. certificate. Scott No. 20L7+1 Estimate $500 - 750. 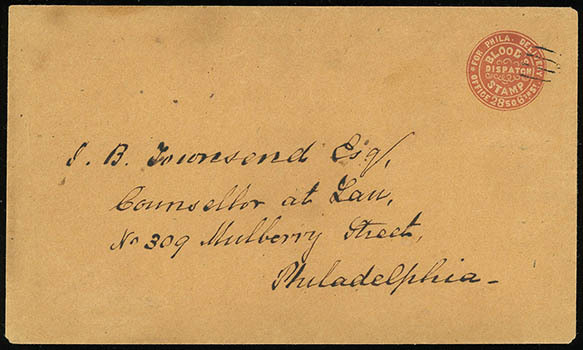 Forwarded by Brainard & Co. from Troy, red oval handstamp and "Collect Six Cents for Hale & Co." box on March 14, 1845 folded letter to New York City street address, Very Fine and scarce conjunctive use. Brainard & Co., 1844, blue, large margins to slightly in at right, faulty with manuscript cancel and tied by filing crease, partial strike of red "Forwarded by Brainard & Co. from Troy" oval and matching red "Paid" handstamp on December 26th 1844 folded letter from Troy N.Y. to Springfield Mass. ; manuscript staining at left, Fine and rare on cover use. Scott No. 24L2; $4,500 Estimate $500 - 750.